Open Studio Tour of Lake Erie regional artists and an annual LakeArts Film Festival provide a strong start and finish for the second annual Chautauqua in June Learning Festival More than a dozen creative workshops including painting, drawing, photography, film animation, writing, jewelry making, and knitting, sewing, and spinning yarn Chautauqua, N.Y. - An open house of artists&apos; studios along the Chautauqua-Lake Erie Art Trail kicks off the second annual Chautauqua in June learning festival over Memorial Day Weekend, May 26-27 and the following weekend June 2-3. During the annual Open Studio Tour, meet 24 artists who make their living in Chautauqua County. Visit their studios from 10 am - 5 pm each day and see recent works in all mediums while getting to know the artists in the personal spaces where they live and create their work. Tour this picturesque region of New York State where Victorian architecture set amongst verdant vineyards and fields, lush forests, rolling hills, and a spectacular Lake Erie shoreline inspires the creative spirit. Artists will be on hand creating pieces, demonstrating techniques and selling their works. The Open Studio Tour is an appropriate start to Chautauqua in June where regional artists and artisans will offer more than a dozen classes and workshops in painting, drawing, photography, and film animation as well as jewelry making, knitting, sewing, and spinning yarn. 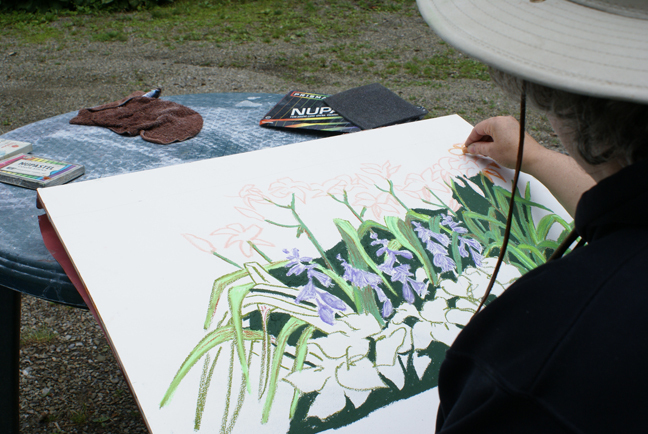 Several workshops will occur en plein air, or "in the open air", such as in the artist&apos;s garden with instructor and artist, Thomas Annear. Students will learn color theory and composition while completing an oil painting inspired by over 40 varieties of irises and poppies. Using the spring flowers growing around Chautauqua Institution for ideas, artist and retired teacher, Audrey Kay Dowling will offer a three day drawing series focusing on line drawing, shading, and color theory. Exclaimed Dowling, "I have always loved teaching and this is a wonderful opportunity to share how to capture the beauty of spring flowers in a gorgeous environment and spend pre-season time at Chautauqua when the pace is relaxed, and there are no parking restrictions or fees. Drawing is a meditative process that is both relaxing and rewarding while also being fun and stimulating, and being creative activates parts of the brain that many folks have neglected." Two different workshops will offer new perspectives on taking photographs. The Art of Taking a Second Look with award-winning nature photographer Gary Cuckler will include a field trip to the Allenberg Bog, an area of terrain that has changed very little over the last 12,000 years since the last glacier moved through the region. Landscape photographer James Hoggard will use vineyards as the muse for teaching basic photography skills including camera composition, lighting, color balance, and depth of field. A small class size will also allow him to customize the class according to participant interests. Said Hoggard, "with the amazing popularity of digital cameras, it seems everyone has been transformed into a photographer. While these new cameras give nice results there are still numerous ways to improve and get more professional photographs. I am looking forward to teaching my class because, not only do I enjoy sharing my experience about a topic that I love, but I always come away learning something myself!" Students of all ages will enjoy making their own short animated movies using stop-frame motion as portrayed in the movie, HUGO, with animation artists and faculty from Edinboro University of Pennsylvania. Others might enjoy using sea or lake glass to make beautiful jewelry at Imagine! in Bemus or learning how to spin yarn with instructors from SUNY Fredonia&apos;s Center for Lifelong Learning and Special Programs. Formally educated in fashion design, Margot Stuart from Ariel&apos;s Bed & Breakfast will teach couture costume design techniques using a 30" teddy bear in a Designer Santa Bear Workshop. Aspiring writers will have opportunities to learn and develop their craft as well during the annual Chautauqua Writer&apos;s Festival and a workshop on Adapting Literary Works for the Screen. Capping off Chautauqua in June, the LakeArts Film Festival, June 15-17, salutes the 2012 election year with classic movies about American politics and politicians along with workshops, discussions, and an exhibit by photographer Barbara Proud called First Comes Love: Radical Spirits, Civil Rights and the Sexual Evolution. Several films will be screened including the 1949 classic All the Kings Men and the 2008 drama, MILK, starring Sean Penn as Harvey Milk. In conjunction with the animation workshop, the LakeArts Festival and Chautauqua Cinema will also screen the Academy Award-winning HUGO, directed by Martin Scorsese. On Sunday June 17, the LakeArts Festival, in collaboration with the Rod Serling Foundation, and the Menace the Public Conscience Festival&apos;s film preservation program will present THE MAN (1972), a recently discovered Rod Serling film about the improbable rise of a black President in the 1960&apos;s. The film, which is in the process of being restored, features well-known stars from television and film including James Earl Jones, Burgess Meredith, Jack Benny (in a cameo), and Martin Balsam. Movie goers will have the opportunity to see and hear about the process of preserving a classic and newly-discovered landmark film. Chautauqua in June is a three week learning festival, May 25 - June 17, 2012, with classes and workshops held in both indoor and outdoor classrooms across Chautauqua County, NY, a destination for leisure learning, summer camps and workshops. Participants can register for workshops online or request a program guide at http://www.tourchautauqua.com/. Note, that creative workshops that require more individualized instruction are limited in size, and registrations are available on a first come, first serve basis. Chautauqua in June is a promotion of the Chautauqua County Visitors Bureau and held in collaboration with the Chautauqua County Chamber of Commerce, Chautauqua Institution, Jamestown Community College&apos;s Center for Continuing Education, SUNY Fredonia Lifelong Learning and Special Programs. Partners include Webb&apos;s Resort, Camp Chautauqua, Portage Hill Gallery and Johnson Estate Winery. Chautauqua County is located in the southwestern corner of New York State with New York&apos;s largest grape growing region, five lakes, historic Victorian and Amish communities, and Lucille Ball&apos;s hometown. For more information and a schedule of vacation learning events during Chautauqua in June as well as throughout the year, call 1-866-908-4569 or visit the Chautauqua County Visitors Bureau website at http://www.tourchautauqua.com/.